^ a b Farley, Reynolds (1991). "The New Census Question about Ancestry: What Did It Tell Us?". Demography. 28 (3): 411. doi: 10.2307/2061465. ^ Lieberson, Stanley; Santi, Lawrence (1985). "The Use of Nativity Data to Estimate Ethnic Characteristics and Patterns". Social Science Research. 14 (1): 44–46. doi: 10.1016/0049-089X(85)90011-0. ^ a b c Lieberson, Stanley & Waters, Mary C. (1986). "Ethnic Groups in Flux: The Changing Ethnic Responses of American Whites". Annals of the American Academy of Political and Social Science. 487 (79): 82–86. doi: 10.1177/0002716286487001004. ^ Lieberson, Stanley (1985). "The Use of Nativity Data to Estimate Ethnic Characteristics and Patterns". Social Science Research. 14 (1): 44–46. doi: 10.1016/0049-089X(85)90011-0. Reynolds Farley (August 1991). 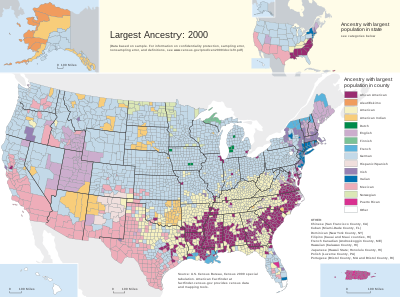 "The New Census Question about Ancestry: What Did It Tell Us?". Demography. 28 (3): 411–429. doi: 10.2307/2061465. PMID 1936376. Archived from the original on July 16, 2009.